@BifBangPow: TOY FAIR 2015 PREVIEW: Bif Bang Pow! Invades New York! TOY FAIR 2015 PREVIEW: Bif Bang Pow! Invades New York! Baton down the hatches and sound the alarms because it’s that time of year again! That’s right, it’s Toy Fair time! From February 14th – 17th, Bif Bang Pow! will be at the New York Toy Fair 2015 in full force with an exciting lineup containing all-new products from some of the world’s most popular licenses. This year we will be revealing all-new action figures, bobble heads, journals, nesting dolls and much more at the Bif Bang Pow! booth #4945. 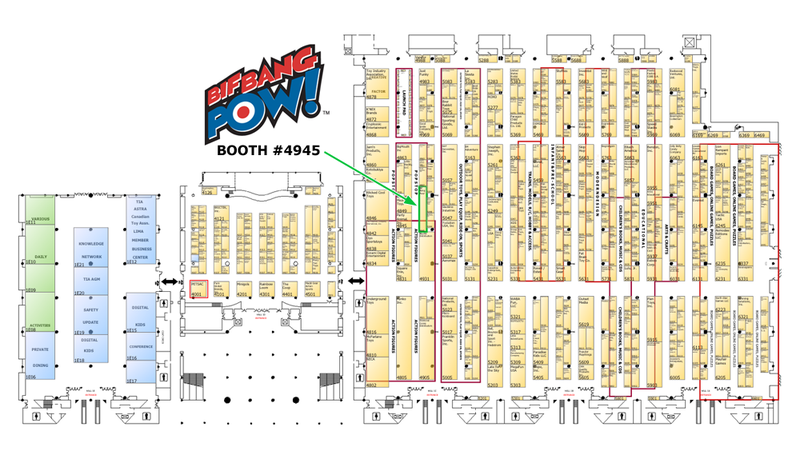 If you’re going to be at the show and you want to visit, use this magical map to locate the best booth in the building! As a small taste of what’s to come, here is a quick teaser from one of our renewed licenses with Universal Partnerships & Licensing. Bif Bang Pow! abides again with The Big Lebowski The Dude 12-Inch Figure! 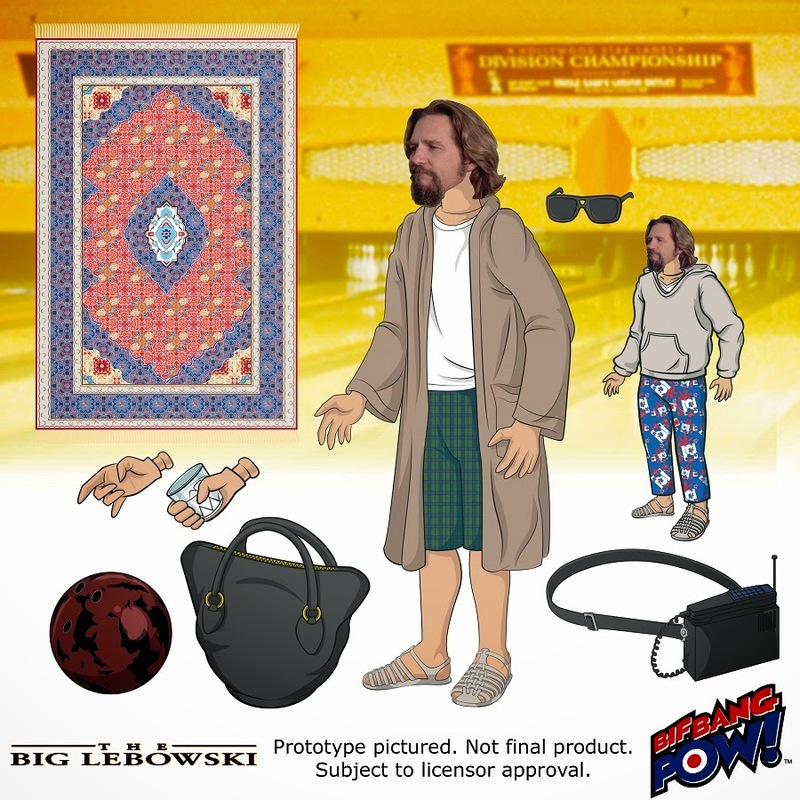 including movie-accurate accessories like the bowling ball, bowling bag, sunglasses, cell phone, White Russian, jelly shoes, two multiple piece cloth outfits and of course the rug that pulls the whole figure together. If you can’t make it to the show, be sure to stay tuned to this blog, our twitter feed @BifBangPow and Entertainment Earth News for more new reveals throughout the day! Bif Bang Pow!™ designs and develops first-rate memorabilia from well-known licenses such as The Big Lebowski, DC Comics, KISS, Flash Gordon, Penny Dreadful, Mike Tyson Mysteries, The Big Bang Theory, Star Trek™, Saturday Night Live, Adventure Time, Regular Show, and The Twilight Zone™. Founder Jason Lenzi is a seasoned television producer and the ultimate fan of cultish pop culture, so when he created his company in 2005 he took the fan’s perspective. His idea was to bring items to the marketplace that he himself would want to own. Cultivated from TV, movies, books, comics, music, and more, Bif Bang Pow!’s mission is to provide high-quality action figures, toys, and collectibles to the massive cult audience (and kids of all ages) that wishes these toys were already in their collection.